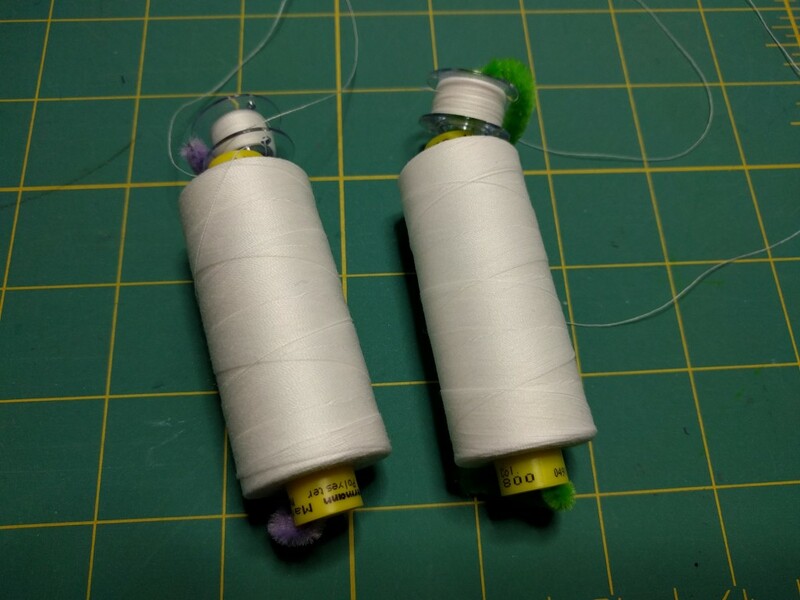 For the third article in my Tuxedo Shirt series, I wanted to reflect on the project, as well as the prospects of turning a hobby into a cottage industry of sewing for others. Though the project was ultimately successful, I had my share of setbacks along the way, and there were a few things that didn’t go the way I had hoped. The biggest regret was that I wish I had run the original fabric through the washer immediately after purchasing it. I would have known early on that that it might have been too stiff for the project, and perhaps made a test garment. Instead, I had misgivings at the start of construction with only weeks to go, and had them confirmed only after I had completed a shirt. For most shirt projects I do use standard all-purpose thread, if only for the wide color selection. But for the Tuxedo shirt, I planned to use Gutermann Mara 150, a lighter, finer thread, along with a 70/10 needle appropriate to the thread. I purchased the Mara 150 thread from Bay Tailor Supply, but Wawak is carrying it now. On the second-to-last shirt, made entirely from the heavy, textured fabric, I had indeed used the Mara 150. But after the final shirt was complete, I realized that I had actually used Mara 100 – the heavier, “all-purpose” thread – rather than the fine stuff for the entire project. I hadn’t checked the spools carefully enough when threading the machine. Mara 100 on the left; Mara 150 on the right. Can YOU tell the difference? I figured if I hadn’t noticed the difference until after completing the project, I was fine. It certainly wasn’t something the client noticed. Though in retrospect, the stitching stands out a little more in the final product. 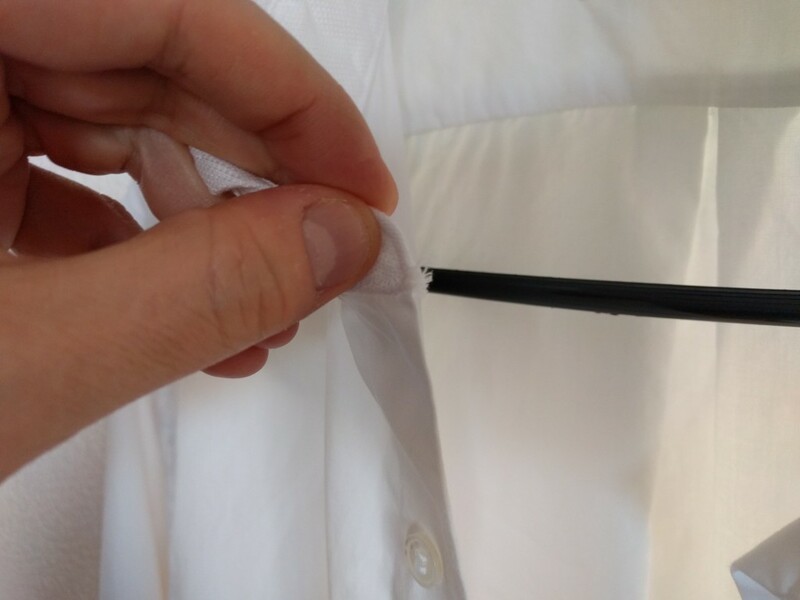 To mark all the buttonholes on the second-to-last shirt, I used a Pilot Frixion pen, the ones that turn invisible when exposed to heat. Several tests with the textured fabric showed that it disappeared quickly and completely, and even when I placed a sample in the freezer the marking lines did not reappear. So I was surprised that faint traces of the pen markings remained underneath the buttonhole stitching, even after multiple hits from the steam iron. Something about the satin stitching prevented the ink from disappearing completely. trying to wash them out. After a single trip through the laundry (cold water, no dryer) the buttonholes on placket and cuffs all carried a blue tinge, and even mark lines that weren’t underneath buttonholes hadn’t come out. With two days remaining, I tried to avoid panic. Instead, I tried scrubbing out the markings with a soft toothbrush and full-strength laundry detergent. The mark lines along the plackets came out nicely; but the markings underneath the buttonhole stitching still did not come out so easily. Even a third trip through the washer with pretreatment, and a bleach stain remover pen did not fully remove the bluish chalk tint, but at least it became something you saw only if you started looking for it. I tested a sample, and was able to get the chalk lines out even when the sample was pressed with a hot iron. I think the satin stitching for the buttonholes simply trapped the chalk, and that a few more washes would clear it out. But at 3am, two nights before the wedding, in front of the washing machine I simply decided it was what it was. Moral of the story: I don’t think it is possible to do to much sample testing. I had assumed these marking methods (Frixion and chalk) would work, but hadn’t tested them in advance with buttonholes. The biggest construction mistake was that I blew out the corner on the right-hand (underlap) side of the collar stand, where it meets the front band. Basically, I visually lost the stitching line with all that white fabric, and pulled and redid the stitches at least twice. When I turned the collar stand inside-out, the corner simply blew and a little frayed mess appeared there. In retrospect, I probably should have drawn a stitching line with the Frixion pen, so that I would have been able to easily see the curve I was supposed to be stitching. I think this can be patched up with some hand overcast stitches, and I may ask for the shirt back at some point so I can make this repair. Though I didn’t mention it in my fitting article, there were some things I learned from fitting a client, rather than myself. The obvious is that it’s much easier, since you can see from all angles, and try out changes while the garment is still on the client. But the less-obvious lesson is that fitting someone else forced me to think harder as a fitter. When sewing for myself, I often stop and deliberate for a really long time about the best way to proceed on some construction technique, pattern alteration, or fitting issue. It’s one of the reasons I’m a fairly slow sewist. But with a person standing in front of me, with both a limited attention span and a fixed amount of time to get the job done, I’m forced to think faster and make decisions quickly. And often those decisions are just as good as the ones that I overthink at leisure. This project was several firsts for me – a client, new design challenges, new construction challenges, pattern drafting, fitting, high standards for success, and a hard deadline. Though I took the project on as a means of furthering my skills, the combination of all these “firsts” proved to be stressful near the end, with a deadline looming close and key issues (such as the sleeve and collar fitting) unresolved. What began as a fun project, eventually became a source of stress. I realized that by pointing out flaws, I would rob my client of the opportunity to enjoy his new shirt. And that would have been sad for both of us, especially after the effort we both put into the project. Instead of focusing on my failures, I can look at my list of accomplishments. I made a pattern for a men’s dress shirt from scratch, starting with a draft copied from a garment. I fit the shirt to the client. I drafted from scratch sleeves, as well as finishing details such as collars, plackets and cuffs. I arrived at a unique style for the shirt that both distinguished it from off-the rack, yet still worked as a piece of formal wear. I constructed a shirt that passed for something professionally made. I made both bride and groom happy. That’s a lot that went right and I’m really pleased I took on this project. Two individuals deserve special thanks. To David Coffin, the project would not have been possible without the resources in his books, magazine articles and online courses. I used some of his construction methods in this project for the first time, and he graciously provided me assistance via email. To Paul Gallo, for the live instruction in draping and pattern making. He spent basically an entire class session showing how to draft sleeves, collars, and the other portions of a men’s dress shirt. He answered my questions and provided valuable feedback to help me fit the client, especially for neck and sleeves. He also helped give me the confidence to think I could carry on and complete the project. This entry was posted in Clients, Completed Projects, Shirts and tagged tuxedo-shirt on May 2, 2016 by mportuesisf. I really enjoyed reading your experience of working with a client. The angst of sewing to a deadline, for an important event for another person is so well outlined here. I like your approach to this project, I’m sure you’ll get referrals when your shirt is seen out on public. Great post! I too had a problem with chalk when working on a wedding dress. I found the blue water dissolvable pen works well, even on white. Sewing for others is really really stressful. I recently decided to not go into to business after all altering and making bridal gowns for hire. Too many sleepless nights worrying and just not enough pay to make the stress worth it foe me. I hope you don’t hesitate to charge what you feel is worth it for you. People just try to chisel the price down anyway. Good luck! After many years of sewing, I have narrowed my marking tools to three items. For white fabrics I always use a purple disappearing ink pen. It marks tight purple lines, and will evaporate within two days. I once costumed a show, and I needed to drape two white poly charmeuse goddess gowns. After all the fittings and draping and all the purple marks I made, the costumes were literally purple. The actresses were worried, but I assured them, the color would disappear, and sure enough, they were pristine pure poly white in two days. For dark colors I like using a Chaconer, it chalks out a very fine white line that can be easily brushed or wiped away. 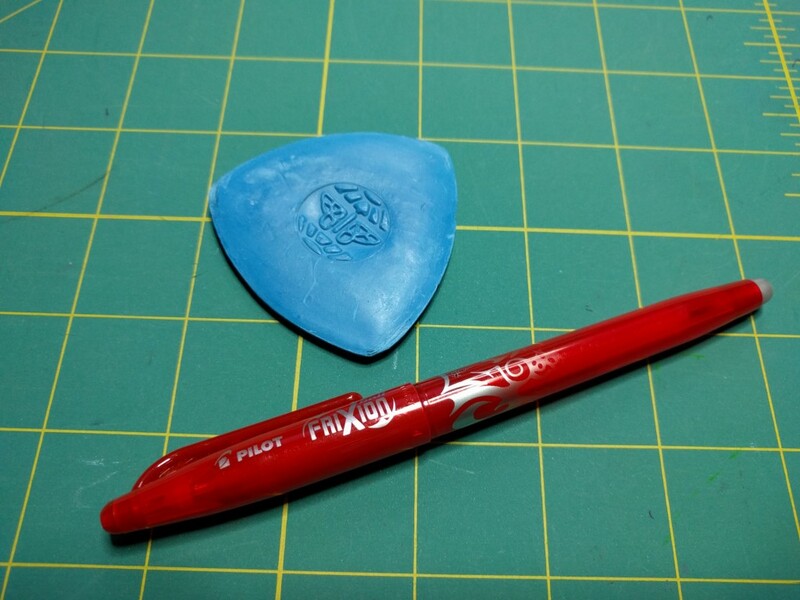 For general use, I like using triangle tailors chalk, it makes clean lines that easily are removed. The blue water soluble pens don’t always wash out, and even though it looks gone, the blue can reappear. In general, stay away from colored chalk on white fabrics, sometimes the chalk just won’t wash out. Buy the purple pens by the dozen, the Chaconer and triangle chalk singly from WAWAK.com. I’m glad you forged ahead in spite of the mounting stress level…..but to be honest, I wouldn’t do it for all the tea in China! Another method for marking buttonholes is to cross two pins where the hole is to end. On several high-end shirts I’ve owned you could still see very faint, pale, tiny regular graphite pencil markings. They were only visible when looking very closely and faded away over time. My favorite fine thread for typical shirting fabrics remains DMC 50wt 2ply, but Mettler 60/2 silk-finish is great, too (more expensive), and Aurofil 50 is supposed to be much the same. They all come in tons of colors. I hope you didn’t charge him for the shirt. If you didn’t, then that’s good of you. However, if you charged him, then you should be ashamed of yourself. Those mistakes are not excusable, and to not tell your client is dishonest of you. You should have owned up. But, instead, you chose the easy way out, and took zero responsibility for your inexperience. My advice, if you really want to make shirts for a living, then you need to learn from a professional (either through college courses or an apprenticeship). There are many issues with your shirt–both fitting and construction. What an amazing project to do! The amount time and energies spent on the multitude of details was incredible. Any client would be thrilled to have such a dedicated professional involved in bringing a project to life. The retelling of your experiences can be an example for anyone who is inspiring to create garments. The honesty is so well appreciated. As I am one of the few people who saw the pure joy of your client’s face during each of the fittings, and the verbal exchange between the two of you. It was clearly an extremely special and moving experience for him to be so intensely involved in the design and creation of his wedding attire. Your professionalism was a constant and has inspired many your fellow sewists. Keep up the GREAT work. I always look forward to your blogs for the amazing information and heartfelt honesty that you put into them. Thank you so much. It’s nice to get the perspective from somebody who had a ringside seat to the creation process – that’s a first for this blog! In the studio, I was so involved working with the client that I wasn’t fully aware he enjoyed the experience as much as I did.